Breastplate of the XVI century was a necessary element of battle outfit of any English knight. The presented model is quite solid and reliable; it protects all vitals at the highest level. Chest medieval armor covers the torso from the front, skirt (faulds) and tassets protect hips and partially groin. Segmented tassets are attached to the skirt with leather belt and buckles. In options, you may choose another type and thickness of metal, color of belts, finish treatment and decoration for your knight chest plate. You may also like these models of European metal armor: Churburg type breastplate of the XIV century, breastplate of the XIV century. In section “Cuirasses, breastplates and gorgets”, you can see all models that we offer for ordering. If you didn’t find any for your taste and wish, please send us photo and description of the required model and we will make it for you. 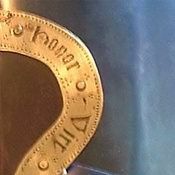 Articulated gorget (bevor) is an element for chin, neck and throat protection. Some large models could also cover shoulders and upper part of chest of knight. Medieval warriors usually wore movable bevor together wish such types of helmets, as armet, visored sallet or chapel-de-fer, burgonet. In case of necessity, it could be easily opened or closed. You can use this custom-made metal gorget armor for: SCA HEMA Larp Stage performances Medieval festivals Reenactment events Base price includes following options: Cold-rolled steel 1.0 mm; Satin polishing; Brown leather belts; Steel nickel-plated buckles; Steel rivets; No decoration; Painting inside Main photo shows medieval metal gorget with following options: Cold-rolled steel 1.5 mm; Satin polishing as finish treatment; Brown leather belts; Steel rivets; Steel nickel-plated buckles; Painting inside In options, you may choose another type and thickness of metal, color of belts, finish treatment and decoration for you..
Churburg type breastplate of the XIV century is based on the well-known model of medieval plate body armour. Handcrafted steel protection consists of nine segmented parts, connected with rivets. There is a reinforcement V-shaped stop rib under the neckline of armor. Museum sample also has a lance rest on the right side and we can install it on your chest armor, by your request. Plate armor from Churburg Catle Breastplate has shoulder straps and belts for comfortable wearing. Medieval knights wore such body armor over the padded protection and chain mail, so we recommend you to follow the lead. You can use this custom breast armor for: SCA HEMA Larp Stage performances Medieval festivals Reenactment events Base price includes following options: Cold-rolled steel 1.0 mm; Satin polishing; Brown leather belts; Steel nickel-plated buckles; Steel rivets; No decoration; Painting inside Main photo shows authentic armor with following options: Cold-rolled steel 1.5 mm; Satin po..
One-piece breastplate has appeared in the late XIV century. This part of armor was in use by knight of all military branches for centuries. Chest plate could be used as a single item for torso protection, so together with back plate – in this case, such plate body armor called cuirass. Roundish breastplate was usually worn over padded underarmor or/and with chain mail. From the backside, there are leather belts for wearing of chestplate. To complete your knight armor set, we recommend to wear this torso plate together with plate spaulders. You can use this custom plate armour for: SCA HEMA Larp Stage performances Medieval festivals Reenactment events Base price includes following options: Cold-rolled steel 1.0 mm; Satin polishing; Brown leather belts; Steel nickel-plated buckles; Steel rivets; No decoration; Painting inside Main photo shows functional body armour with following options: Cold-rolled steel 1.5 mm; Mirror polishing as finish treatment; Brown leather belts; ..
Milanese cuirass of the 1460 year is a classical model of Italian plate armor. This model of medieval armor is based on the painting “Brera Madonna” by Piero della Francesca. Brera Madonna, 1472 year Classical Milan-style cuirass combines features, typical for body defense of those times: Roundish breast and back plates, joining together with leather belts; Plackart, connected to the upper plates; Movable skirt of four horizontal segment, connected together with rivets; Tassets, attached to the lower part of skirt; Culet – plate for buttocks protection; Lance rest on the right side of cuirass. Such cuirass was usually worn together with different-sized Milanese pauldrons. You can use this functional knight body armour for: SCA HEMA Larp Stage performances Medieval festivals Reenactment events Base price includes following options: Cold-rolled steel 1.0 mm; Satin polishing; Brown leather belts; Steel nickel-plated buckles; Steel rivets; No decoration; Painting ins.. This model of Gothic cuirass is based on the patterns from the funeral armour on English knight Ralph Fitzherbert (d.1483). 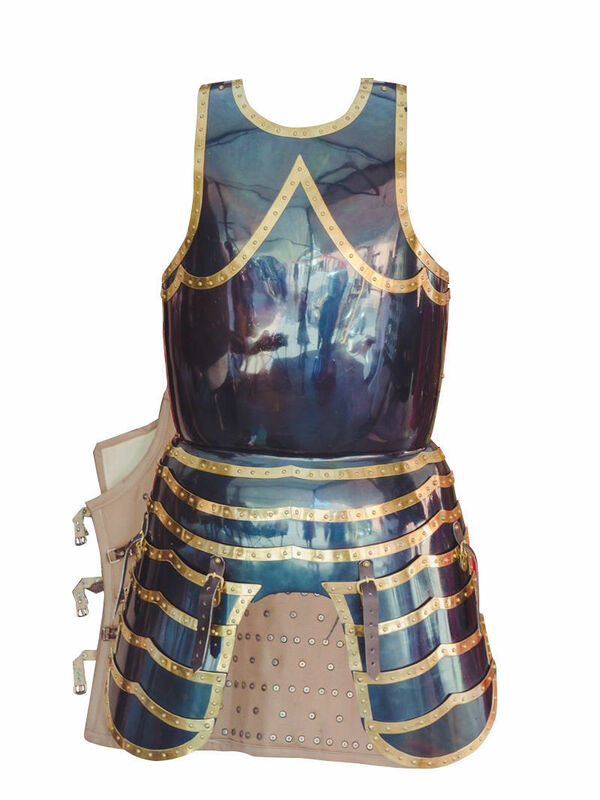 English plate cuirass has breast and back plates and the skirt made of five segments. The tassets are attached to the faulds with the leather straps and buckles, so they are detachable. Plackart (bottom part of armor) is attached to the breastplate with leather belts and buckles and protects belly and groin partially. This element of Gothic armour does not have ribs and fluting on the surface (as many models of Gothic plate armor did have), but we can make it by your wish. You can use this functional combat armour for: SCA HEMA Larp Stage performances Medieval festivals Reenactment events Base price includes following options: Cold-rolled steel 1.0 mm; Satin polishing; Brown leather belts; Steel nickel-plated buckles; Steel rivets; No decoration; Painting inside Main photo shows authentic steel cuirass with following options: Cold-rolled steel 1.5 mm; ..
Milan-style cuirass 1450-1485 years, a part of "Avant Armour"
Well-known "Avant Armour" is dating from about 1450-1485 years. It was crafted in Corio workshop, Milano, and was belong to Fon Matsch, the owner of Churburg Castle in the 1450 year. This Milanese armor is one of the most famous type of medieval full-plate body protection. Now this armour is in almost perfect condition and is shown in Kelvingrove Art Gallery and Museum, Glazgo, Scotland. Roundish plate cuirass includes several parts: Breast plate and back plate. Joined together with leather belts and buckles; Plackart, which is fastened to the front and back plates; Segmented skirt (faulds), made of horizontal straps, which are connected with rivets and hinges; Tassets – plates, which protects hips. Fastened to the lower part of skirt Other parts of "Avant Armour", such as Milan-style pauldrons and plate legs, will be great addition to this plate body protection. You can use this functional knight body armour for: SCA HEMA Larp Stage performances Medieval festivals Reenactm..